Getting Into The Groove Again… with exercise. I’ll admit, I don’t really know what happened exactly…but I fell off the “motivated to exercise” wagon a few months ago. I think it all started with jellyfish. Wait a minute. Did you just say jellyfish? Back in November and December our bay was invaded by jellyfush. I’m not talking about the sweet and docile moon jellyfish with very short tentacles that generally people do not feel their sting. I don’t. I’m talking about the kind with tentacles extending out from their bodies by like 2-3 feet who leave welts the size of a pencil eraser tip and it burns… alot. If you’re small enough these stings could cause some serious damage. Fortunately we can see very clearly into our water and there is a specific season for them. The season lasts only about 2 months at the end of the year (from what we’ve seen and been told by locals) and then they move on to some other, as of yet unknown to us, location. The moon jellies stick around for about another month.. but remember, they’re harmless. It’s still a bit unnerving to swim with them, so I just stay out of the water unless J gives the all clear. That brings me to my point. I fell out of motivation with exercising. I could’ve just skipped swimming and done other stuff. So today I am pledging myself to start anew! Beginning March 1st I’m starting the fitness challenge Military Fit over at my favourite exercise website Darebee. 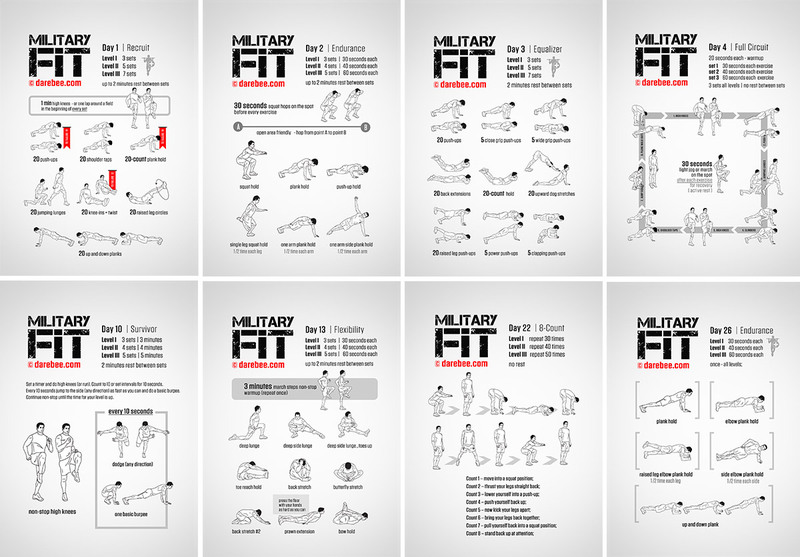 Here’s a preview of Military Fit for those interested in joining me for 30 days starting March 1 or 2 (whichever works for you). I’m a beginning of the month kinda gal. I am downloading the entire program as a pdf and printing it 3 to a page style front/back printing…minimising excuses of internet, electricity or random acts of nature. I’m basically making it so I can grab my “workout book” for the day and do it. I’m even attaching a pencil to keep track of my sets…a timer may need to be dug up as well.. hmmm. I plan on starting with a light stretch routine for my body and feet then completing the workout for the day at level 1. I’ll be adjusting rep numbers and using the “to failure option” since in some of the exercises I don’t know that I could complete the number of reps indicated. But I’m going to give it a go! I will not be doing pull up add on, but plan to try it at some point in the future! If you think this sounds like something you’d like to do, join me. It doesn’t require you to sign up or shout out I’m in! (Though you can shout out “I’m in!” for extra motivation and accountability.) I’ll be posting weekly as is my usual style and possibly putting up before and after info! Maybe even some pictures… We’ll see. Next PostNext Paper Mache Airplanes! !